Ai Weiwei Asks Brooklyn: What Does Your #Activism Look Like? 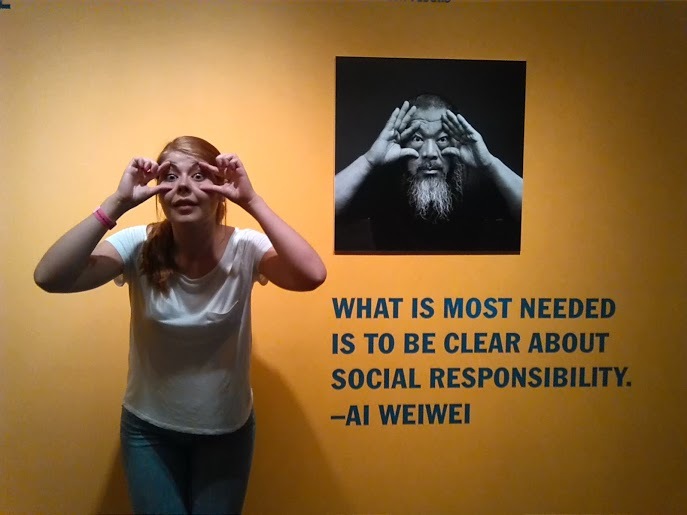 “What does your #activism look like?” Ai Weiwei asks us in his new art exhibit up at the Brooklyn Museum in New York, through August 10th, 2014. His question made me stop and think. As an author, my activism looks like the books I write, like Brindle 24 and Stream & Shale. I wrote these about the degradation of nature and human health after toxic gas extraction known as fracking in the United States. Writing the books helped me deal with the pain and inner turmoil I felt reading news and watching documentaries like GasLand, about people suffering nearby fracking sites. It also helped shine a light the ongoing issues we have with fracking here. Ai Weiwei’s activism is art, and it looks like another world at first, but it is our world too – each piece of art is made with everyday materials like steel bars, backpacks, and even bicycles. His extraordinary exhibit comes to us from China, though the artist cannot. Ai Weiwei lived in New York for ten years. Now, he is denied his passport by the Chinese government, after his art studio began investigating and exposing the deaths of school children in the 2008 Sichuan earthquake. 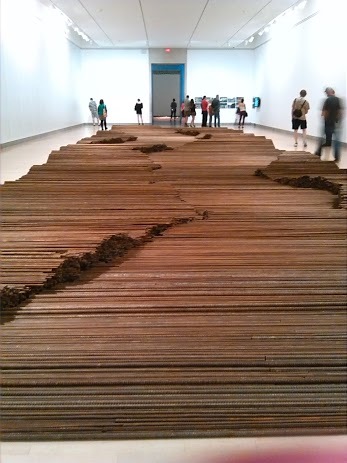 In “Straight”, Ai Weiwei collected and straightened steel rods from collapsed buildings after the earthquake, arranged to create fault lines. This massive sculpture is part of the artist’s activism, showing how faulty building techniques were connected to the collapse of China’s schools during the Sichuan earthquake which killed thousands of school children. 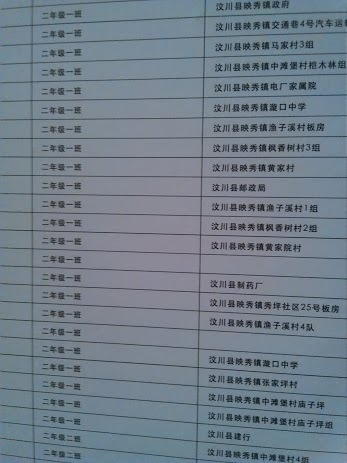 I thought Ai Weiwei was with me as I looked at his exhibit’s installation of the names of school children who perished. He is touching people all over the world with his art exhibits. The lists of children take up the entire wall of a large exhibit room, and more than a number can, each unique name tells a story of loss that he wants us to know and share. The act of exposing these names on his blog was the catalyst for the artist’s persecution which he documents in his film, So Sorry. One of the strangest pieces in the exhibit is He Xie which has 3,200 porcelain crabs, meant to symbolize harmony in the community. The artist used the symbolic crab in his art, and also in a public feast to protest the destruction of his studio by the Chinese government. His struggles with creating art while being under surveillance, detained, and beaten are documented in the film, Never Sorry. The beauty of Ai Weiwei’s art is the strangeness of it, to me. Every piece of art left me with a question about not just Ai Weiwei and China, but my home in the United States, and myself. He reminded me that art connects us and is part of social responsibility. Find out more about Ai Weiwei’s art and activism at his site and on twitter.